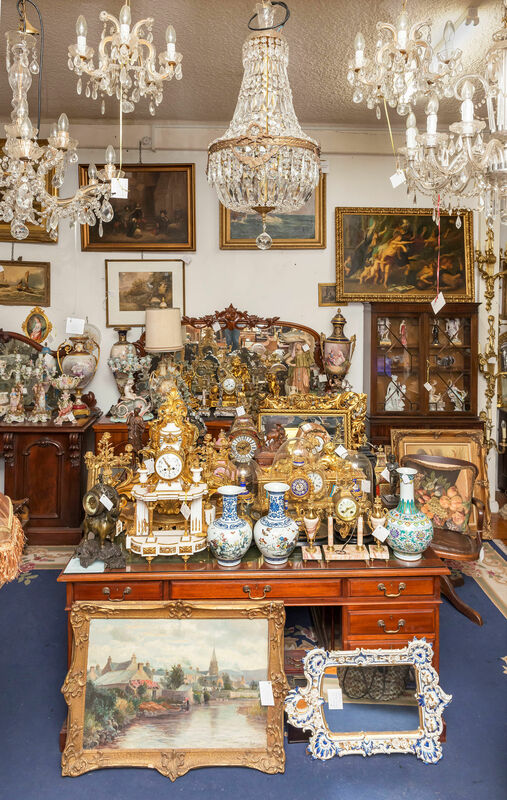 of Antique English Longcase Clocks, Antique Bracket Clocks and others. 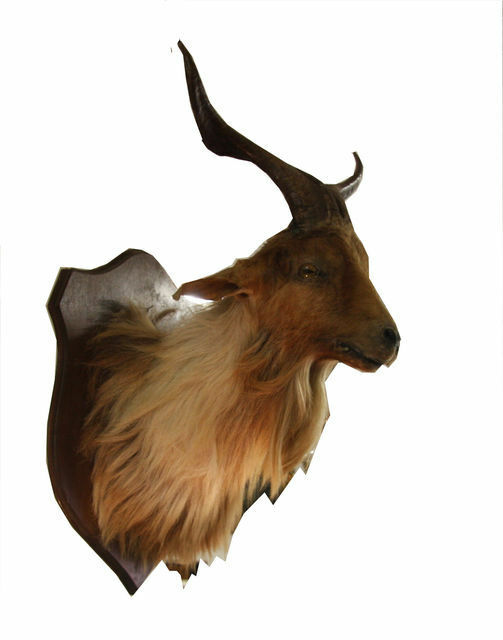 We also have a small collection of Taxidermy, Sydney. the Hours and Half Hour. 38 cms. High. Circa 1880.
candlesticks. Maker: A. Guyon. Circa 1880. Clock 700 high Candlesticks 520 high. 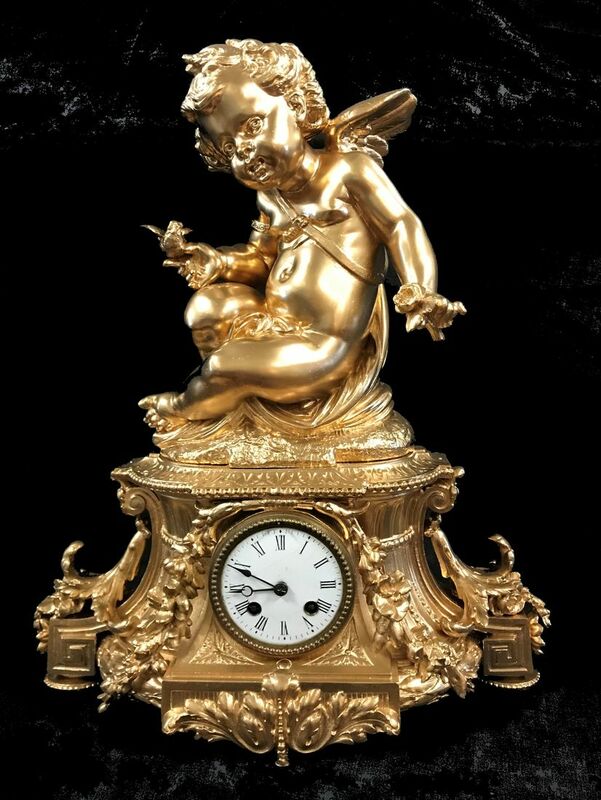 French Gilded Bronze Mantel Clock. With hand painted"Sevres" Porcelain panels. Twin Train movement by Japy Freres. 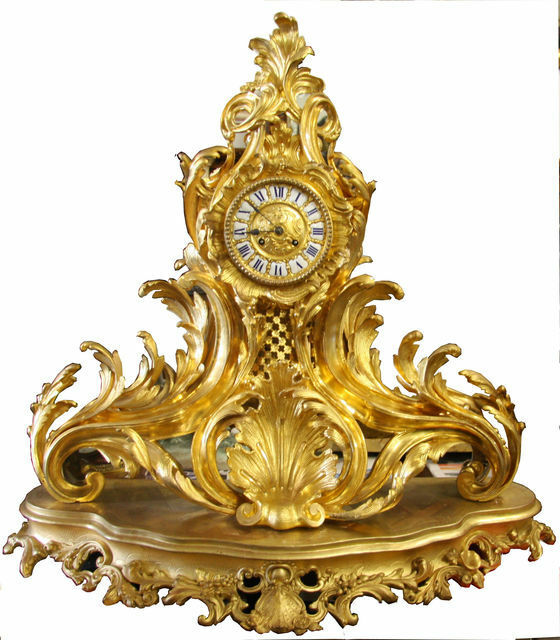 Antique French Gilt Mantel Clock. Twin Train movement, striking the hours and half hour. Circa 1880 50 cm. high. in the Rococco manner.on original ornate carved giltwood base. Movement bynoted clockmaker "J. Marti"
Beautifuuly mounted on timber shield. 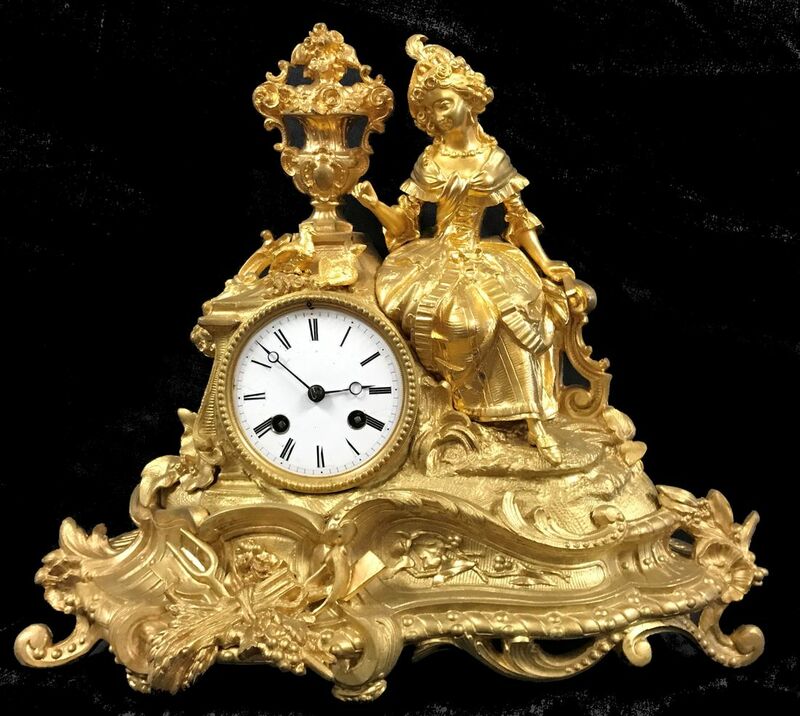 Antique French Gilt Bronze Mantel clock. Antique 18th. 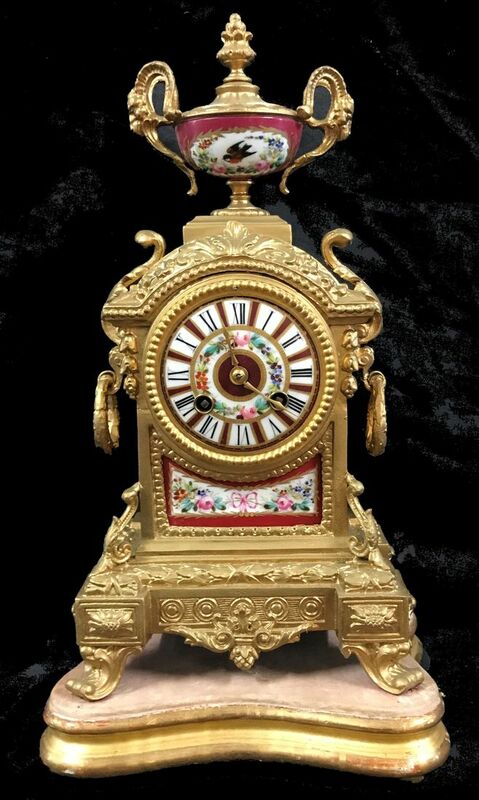 Century French Boulle Bracket Clock. 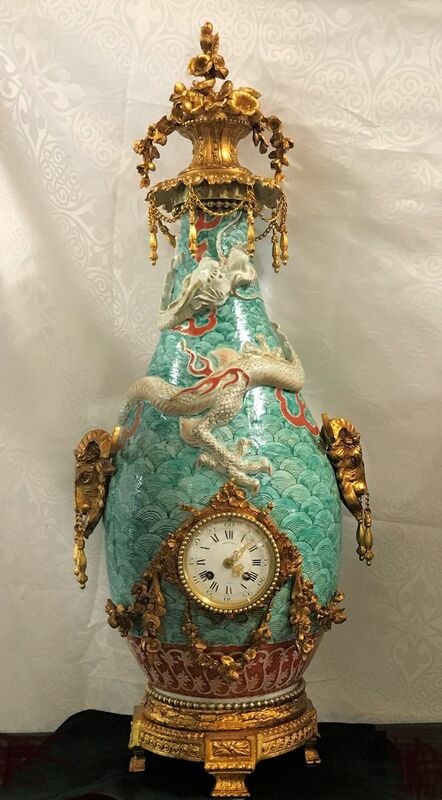 By world famous Clockmaker "Bathazar"
Tortoishell inlaid with Brass and gilded Bronze Mounts. 19th. Cen. French carved Oak Granfather Clock. Roman Numerals on Silver and Brass Dial. The case profusely carved with Flowers. with entined Dragons, superb Bronze mounts. Twin train movement by Leautaud of Paris. Hand painted Dial and front panel, with Urn above. Antique French Alabaster Clock Garniture. With Floral Garland enamelled Dial. Antique French bronzed 3 piece Clock Garniture. Twin train movement , painted dial withCupid and Bird above. Sidepieces nodelled as Urns, all on onyx bases. Superb Shoulder mounted Stag's Head. 12 pointer of impressive proportions. 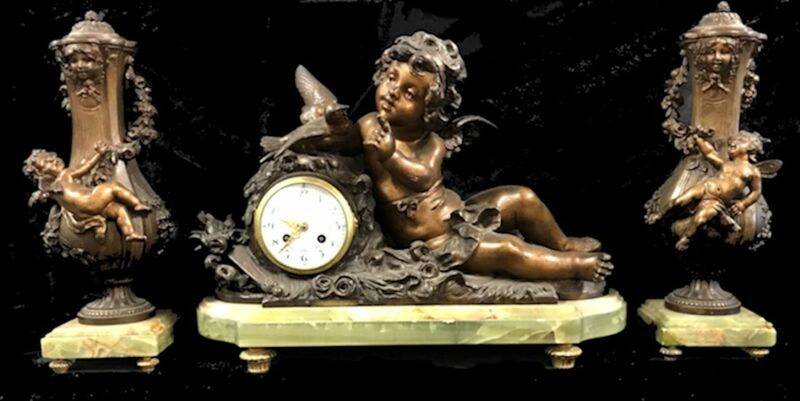 Antique French Bronze and Marble Mantel Clock. Half hour bell. Movement by Pons. Stamped with Gold Medal. 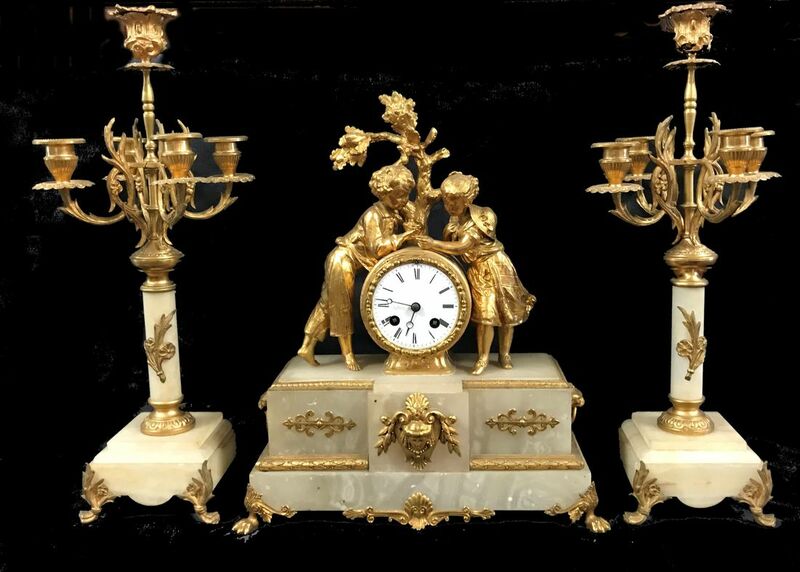 Antique French marble 3 piece clock garniture. 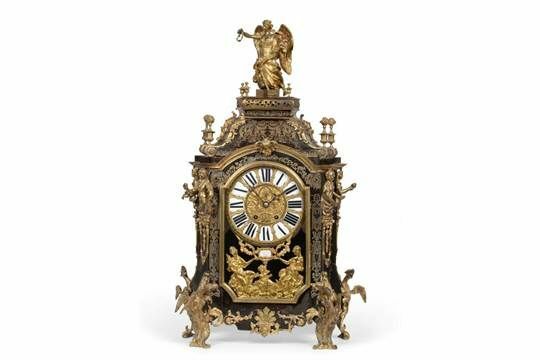 French Court) Clock 400 high Sidepieces 320 high. 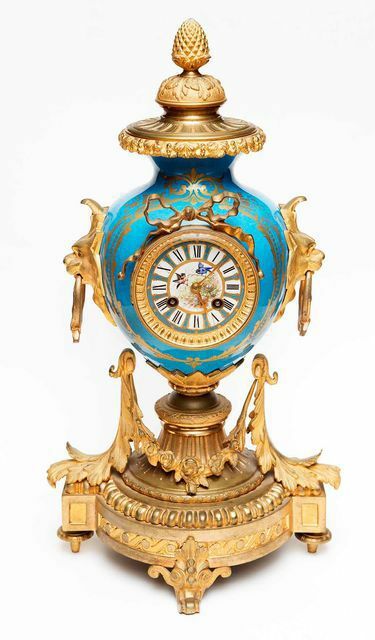 Antique French "Sevres" Porcelain Mantel Clock. Movement, striking the hours and half hour. 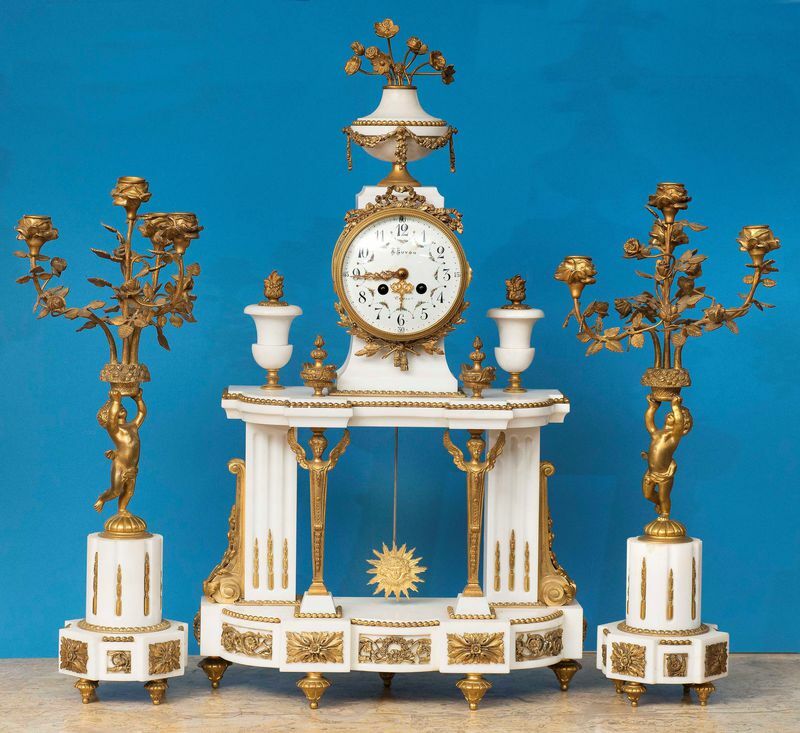 Antique Louis XV Style Table Clock. Tortoiseshell inlaid with Brass, surmounted by a winged Figure. with Figures to the corners and Winged Griffins to the base. Twin train striking movement by noted clockmaker Balthazar. Stamped RC and numbered 793 88 cms. high. 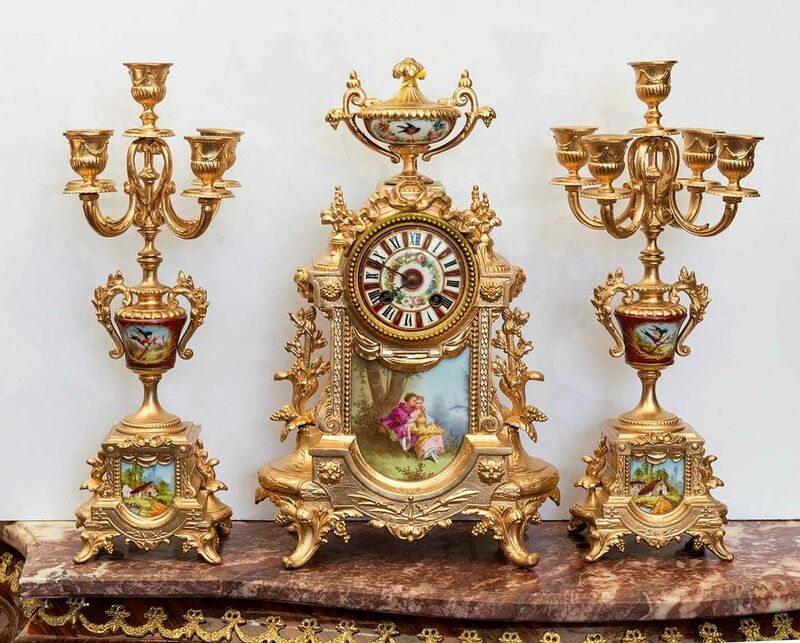 and gilded bronze three piece clock garniture. 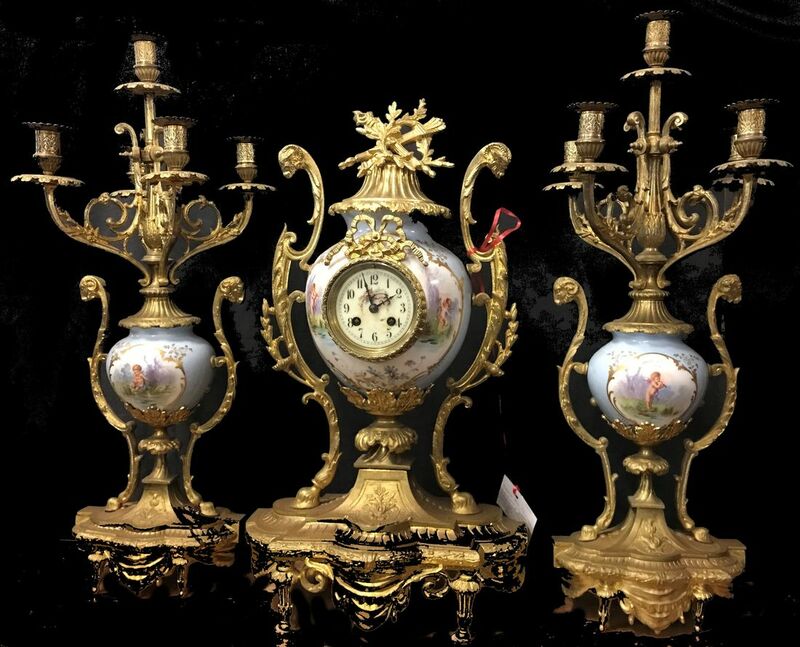 Antique French 3 piece clock garniture. flanked by a maiden and 2 cupids, with 2 matching urns. Antique Monumental French Mantel Clock. by three Bronze Putti. Twin train movement. 900 mm high 800 mm wide. with hand painted "Sevres" panels.